A rapidly changing landscape may be engulfing the Snow Hill skyline – but one constant is St Chad’s Cathedral. The Pugin masterpiece was the first Catholic Cathedral erected in Great Britain in 1841 following the Reformation of the 16th century. Its presence continues today, and St Chad’s is as welcoming as ever to visitors from far and wide. With this in mind a special meeting recently took place (Thurs 11 April) between Archbishop Bernard Longley, head of the Archdiocese of Birmingham – of which St Chad’s is the Mother Church, staff and the firm behind one of the latest developments in the area. The Ballymore Group is responsible for the multi-million pound development at Three Snowhill, which provides fantastic views of St Chad’s from its office space over 17 storeys. As a neighbourly gesture the team at Ballymore invited Archbishop Bernard to take a tour of their new facility, followed by a meeting with Sean Mulryan, the Founder, Chairman and Group CEO. Archbishop Bernard Longley said: “I was delighted to meet with Mr Sean Mulryan and to visit the impressive new building, Three Snowhill, as it nears completion. “This will soon be home to approximately 4,000 city workers, our new neighbours. 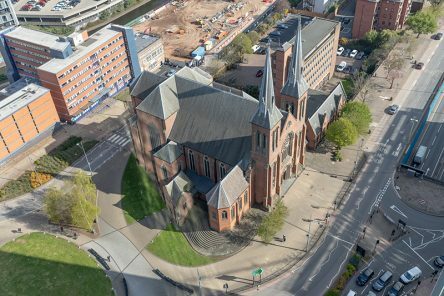 “From their workplace they will have a brilliant view of St Chad’s Cathedral. Mr Mulryan added: “I was delighted that Archbishop Bernard Longley, head of the Archdiocese of Birmingham, accepted my invitation to visit Three Snowhill. “The Catholic Church and parish activities play a vital role in communities across the world and Birmingham is no different. “At Ballymore, we strive to ensure our developments are integrated into the local community which helps create a true sense of place and belonging for those who work in our office buildings but also the local community. The Archdiocese is working hard to develop relationships with its new neighbours, and recently welcomed staff from St Joseph – which is behind the Snow Hill Wharf development – with a blessing at its site. Whatever your reason for visiting we pray that God will bless your search and grant you many blessings. Official Web Site of the Holy See.